Earlier this year, the Avid Customer Association asked its members to vote on a series of feature suggestions for the full range of Avid products in the 2019 ACA Vote including Pro Tools and control surfaces. We looked at the different options in the 3rd ACA vote, which closed on March 17th 2019 and we can now announce the results. In this article we also analyse the results looking at differences and similarities as well as which feature suggestions were popular and which were not popular. Avid tell us that nearly 4,500 people took part in the 3rd ACA vote from over 2500 unique organisations from around 100 different countries, although the majority were from the US. Participants in the Third Annual ACA Vote came from all segments of the industry. In presenting the results Avid and the ACA wanted to be able to understand what the different types of users found were the most important feature suggestions and so as well as the results of the overall voting they have produced a breakdown of how independent creative professionals, creative team members, and enterprise organization employees voted. How Were The Feature Suggestions Selected? All of the items listed on this year’s vote represented recent feedback and requests from across the Avid community, (ACA leadership, ACA members, online forums, market data, industry analysis, Avid product teams and more), which were reviewed by ACA leadership, which is made of key industry leaders that include people from Discovery Communications, CBS News, Capitol Records, Walt Disney Studios, ABC TV, Sky, Universal Music, as well as a number of individuals most of whom are members of the ACE (American Cinema Editors). These results highlight that, as one would expect, the needs of media enterprises and the professional teams are markedly different to the individual creatives. At one level it is not surprising but it is interesting to see them clearly laid out in the 2019 ACA Vote results. Working our way down, the 2nd most popular feature ‘Advanced Pro Tools’ MIDI capabilities (audio-like MIDI editing, in-app MIDI keyboard, MIDI plug-ins, step sequencer, etc. )’ is ranked 9th for Pro Tools users working in media enterprises, showing that enterprise users have much less use for MIDI in Pro Tools, and that isn’t surprising when this group is made up of users from Film and TV Studios and Broadcasting organisations. What is very interesting is that the support for ARA has not had the support in the media enterprises sector, where it ranked 11th, whereas the professional teams sector ranked it 5th with the individual creatives ranking it 2nd, pushing it into 3rd place overall. This is a little surprising especially after we demonstrated how the ARA could improve workflows in post production as well as music production in our article ARA Integration In Pro Tools - Videos And Screenshot Concepts Show Why This Is A Highly Requested Feature. It seems the music production sector has grabbed ARA but the post community is yet to be as taken with what ARA can bring to the table even though we showed that products like Revoice Pro and VocALign from Synchro Arts already support ARA in other DAWs, Sound Radix are bringing ARA 2 workflows to Auto-Align Post and we covered how ARA could significantly improve any workflows involving iZotope RX. When it comes to ‘Improve video engine performance and expand video file format support’ both the professional teams and media enterprises see this as much more important with both groups ranking this 2nd whilst the individual creatives group ranked it 8th, giving an overall ranking of 5th. It also seems that being able to undo deleted tracks is significantly less of an issue for both the professional teams and media enterprises groups ranking it 11th and 10th respectively, whilst the individual creatives group ranked it 6th. The ‘Smart Solo Feature’ did not go down well with the media enterprises group who ranked it 15th whereas the professional teams and individual creatives groups ranked it 8th and 7th respectively. Although this could be seen as a music production feature, implemented well, Pro Tools could look through the audio routing and automatically enable Solo Safe on all the tracks in the signal path so you don’t need to worry about having to manually Solo Safe everything. This should also include signal paths routed via aux sends too. It would be great if Pro Tools also identified the path, by highlighting each of track’s Solo button, making it easy to see the actual audio path through complex routing. This would really help in large complex film and TV sessions in audio post-production where routing through aux sends and stems can be very complex, but it seems that the Pro Tools users working in media enterprises don’t agree. When it comes to Audio Over IP we see the reverse with the media enterprises group ranking this 5th whereas the professional teams and individual creatives groups ranked it 12th and 11th respectively. This is perhaps no big surprise as it is the bigger facilities that can really benefit from Audio Over IP. There are benefits for smaller facilities too but there is clearly work to do to get that message across. Similarly, for the feature suggestion ‘Better Pro Tools interoperability and integration with the Avid ecosystem’, the media enterprises group ranked this 4th, whereas the professional teams and individual creatives groups ranked it 10th and 14th respectively. This makes sense as users working in media enterprises are often working in a larger workflow receiving projects from other Avid products like Media Composer and with more and more work taking place ‘in-the-box’ at all levels, the smoother the workflow from one discipline to another the better. Individual creatives by their very definition tend to work on their own taking a project from start to finish by themselves and so are less impacted by improvements in interoperability. This is mirrored, albeit less so. The ‘Integration of 3rd party video engines’ feature suggestion with the media enterprises group ranking this 14th whereas the professional teams and individual creatives groups ranked it 16th and 18th respectively. What is surprising about this feature suggestion is that it is so far down the ranking across the board. With all the concerns and issues voiced about problems with the Avid Video Engine, we would have expected this to be further up the ranking especially for media enterprises and professional teams groups. Perhaps this isn’t as bigger issue as some have been making out? In the hits department, top across the board, is the ‘Enhance Pro Tools session organisation capabilities with track folders and audio clip folders’ feature suggestion. This first appeared in the 2017 ACA Vote and was listed in the top 10 as ‘New Post workflows offering folder tracks and multiple sessions open at one time’. In the 2018 ACA vote Folder tracks had been separated from ‘having multiple sessions open at the same time’ and was ranked in the top spot and slated as a ‘Planned Release in 2018’. There was no mention of folders in the clip list in the 2018 ACA vote but it was great to see that they have been brought together in the 2019 ACA Vote especially as back in the days of the Pro Tools Ideascale. Folders in the ‘Clip List’ was the most popular feature request from users and it would be a crying shame if this wasn’t implemented into Pro Tools some time this year. Following on from this, the next most popular feature suggestion across the board was ‘Improved data interchange between sessions (better Import Session Data functionality, multiple sessions open at the same time with drag & drop)’ . This first appeared in the 2017 ACA Vote and was listed in the top 10 as ‘New Post workflows offering folder tracks, multiple sessions open at one time’. This is long overdue and is one of the options that has been on the previous 2 ACA surveys in 2017 and 2018 as well as the 6th most popular feature request on the Pro Tools Ideascale in 2018 still to be implemented. It would be great to be able to drag and drop clips, tracks, plug-ins etc from one Pro Tools session to another by having them both open at the same time improving the ability to move a wide variety of content from one session to other, especially with drag and drop. Moving to the bottom of the results and the feature suggestions that have not engaged with users across the board, ranked 17th overall ‘Extend Pro Tools’ existing support of many surround, immersive and VR audio formats, to generic immersive audio and other existing formats such as DTS-X, MPEG_H, and Auro-3D’ was a surprise. With the growth of immersive formats thanks to the likes of Netflix and explosion in VR, especially in the games industry, we would have expected this to be much further up the list. Following on from that, ‘Allow use of the “Dolby Audio Bridge” for connection with renderer software’ was ranked 19th out of 21 feature requests. We would have expected a higher ranking in the enterprise organisations group, as they are the most likely to be using large Dolby Atmos workflows, but that group also ranked it 19th with the professional teams group ranked it as the least popular feature suggestion. It could also be a case of “If it ain’t broke, don’t fix it”. The feature suggestion ‘Improve satellite link performance and functionality’ takes up the penultimate position although the professional teams group did rank it 18th, with the individual creatives group put it in last place, reinforcing that this feature is not on the radar for Pro Tools users working on their own. Finally the virtualisation feature suggestion, whether on the premises or over the cloud has not resonated with any of the Pro Tools users at all. Perhaps this isn’t that surprising as although there is merit in this way of working when it comes to video production with remote working using proxies to help teams work across huge amounts of content without having to move media around, it doesn’t really translate that well for audio workflows. The differences in rankings for each of the feature suggestions in this section are much less marked than with Pro Tools, with only 1 place differences between the groups, with the media enterprises group preferring the enhancement of Pro Tools and Eucon Metering over Eucon custom plug-in mapping and control over clip effects over plug-in instantiation from the surface. Other than that, all users were in agreement about the Control Surface related feature suggestions. More CoreAudio Outputs For MADI And AoE In the Wrong Section? Looking at the results the feature suggestion ‘Allow more CoreAudio outputs for MADI and AoE’, we feel is in the wrong section. This should have been in the Pro Tools section and seems to suggest Avid might be looking at breaking out of the 32 channel I/O ceiling for Pro Tools Native for audio coming in via MADI or Audio over IP like Dante, Ravenna, AVB or AES67. Now that would be a feature that would get a lot of interest! Looking at the results reinforces to us that there is one feature suggestion that should be there in the Control Surfaces section and that is extending Eucon support to 3rd party control surfaces like the JLCooper or the Presonus Faderport range. This would give users a much bigger range of control surfaces to choose from whilst maintaining the deep Eucon integration with Pro Tools. If you voted in this latest ACA survey then you are one of over 33,000 members of the Avid Customer Association and you can access the full vote results report by going to the Vote section on the ACA website. Looking at the results overall, Avid clearly face a challenge in providing feature sets for their different Pro Tools user bases with users working on larger projects, whether in the same place or working separately as part of a disparate team needing different features like audio over IP, improved video engine performance and better interoperability as well as integration into the Avid ecosystem, whereas people working largely on their own are looking for features like advanced Pro Tools’ MIDI capabilities, support for ARA technology and undo deleted tracks. It also seems that the weighting to get the overall ranking favours creatives working on their own, and that may need looking at in the future or perhaps Avid should just concentrate on the different user groups, in deciding which features they need to implement first. Unlike previous ACA Vote result announcements, this year there is no mention as to how this will impact the new features plan that Avid has for Pro Tools. Avid has told us that the Product Management team will review these results in more detail following Avid Connect 2019. As they incorporate the ACA’s priorities into upcoming product plans, Avid will provide regular status updates for all of the items voted on in the 3rd ACA Vote and we can expect to see the first update coming out in the next month. It will be interesting to see how Avid responds to these results and which feature suggestions get taken up first, especially in the light of some of the recent comments about Avid focusing on features users didn’t ask for. Avid Kill Ideascale - What Next For Getting The Pro Tools Features You Need? 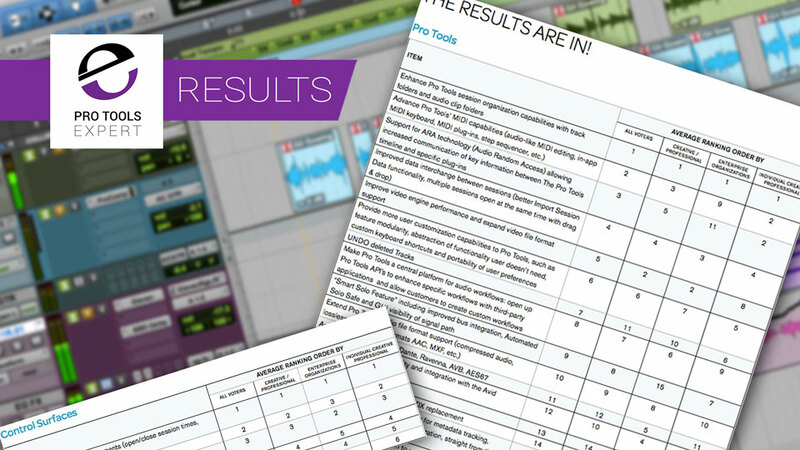 Pro Tools Product Road Map - Are Avid Giving Us Some Clues Here?